I have a few new writing items to share this week: First, I’m happy to announce that Sony Books has finally released the Japanese translation of Vagabonding. Entitled 旅に出ろ! (which Babelfish tells me means Appear in the Traveling! 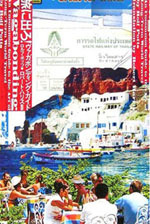 ), it was translated by Robert Harris, a Japan-based writer and radio personality specializing in travel. I have yet to receive a copy of this Japanese edition (and I’ll have trouble reading it once I do), so I’d be interested to know what readers think of the translation. The three weeks that followed were filled with the joys of the unexpected. My new bicycle, I found, had a max speed of about five miles an hour—a perfect tempo at which to discover the Burmese countryside. Mangoes were in season, so I bought armfuls of the sweet fruit for pennies apiece. When unmapped ruins or stupas graced the roadside, I stopped to investigate and linger. I slept in villages along the way, where townspeople offered to put me up in Buddhist monasteries. In a town called Pakokku, an English teacher invited me to speak to his students, and after class they all took me to a pwe festival at the town pagoda (where, believe it or not, a crowd consisting of families and monks watched a Burmese transvestite cabaret troupe lip-synch to Boney M’s “Bahama Mama”). My full Burma bicycling anecdote from National Geographic Traveler is online here. The full Forbes story, which includes my off-the-grid destintation recommendation (Mongolia) is online here. Just glad to hear you’re still around after the tornado in Kansas. Congrats on getting your book translated into Japanese!